Suncast receive exceptional feedback for their highly acclaimed quality outside plastic storage sheds. 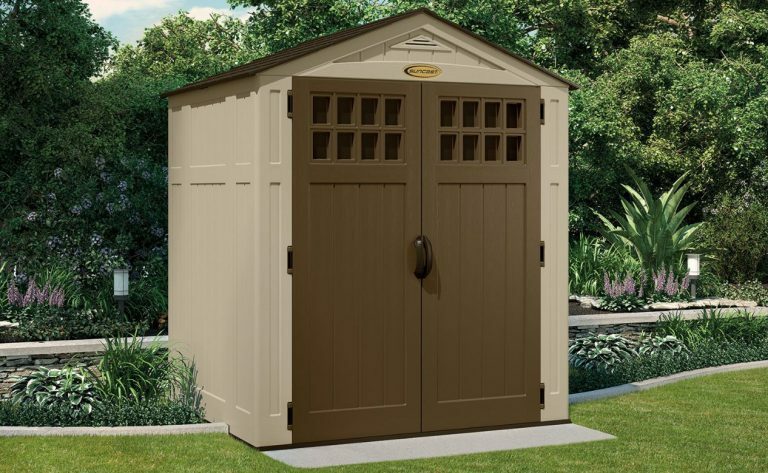 Whether you are looking for a small 6×3 shed to store your patio accessories or a super spacious 8×16 shed to store all your outdoor storage, there’s a Suncast shed to serve you. 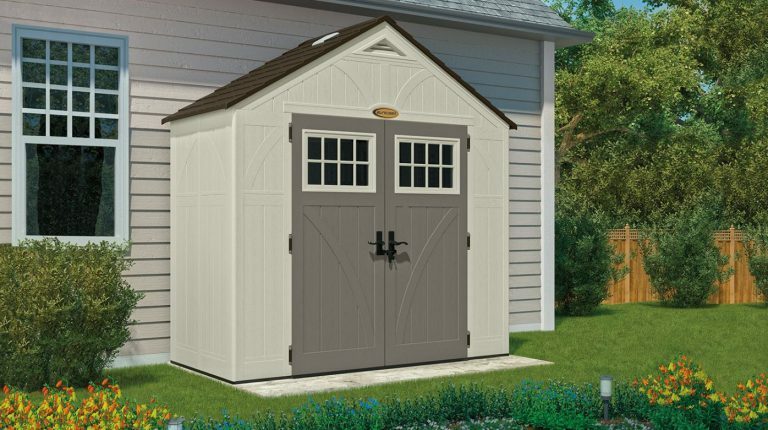 Suncast sheds are designed to protect your storage, keeping it dry and safe allowing room to be created indoors and the garage by storing your stuff inside these sheds. They all have the famous Suncast distinctive look, stylish sheds with a modern appearance that will enhance any patio, backyard or garden. Suncast sheds are constructed out of blow molded, double-walled panels made from polypropylene and polyethylene resin which helps the environment. This resin is weather-resistant and durable providing protection against rain and snow. The resin sheets overlap and snap together during assembly resulting in a sealed unit preventing rain and pests from entering. These are extremely low-maintenance sheds, no rust, rot or decay to deal with, the beauty of a resin construction. A wash or hose down is all that’s required. The resin is UV stabilised for protection against fading and cracking in the sun but it should be noted that under extremely high temperatures all plastic softens slightly but is designed to return to it’s normal state once the temperature drops. Under extremely low temperatures, well below freezing, all plastics become more rigid, prone to accidental damage, but will return to their normal state once the temperature rises. The roof is also constructed out of polypropylene and polyethylene resin, molded to give an attractive tile affect yet has the benefits of weather-proof resin. The resin walled panels are built within a steel reinforced frame to provide stability and strength whilst the apex roof is supported with metal trusses and ridge beam to provide an overall strong shed built to withstand the weather elements. 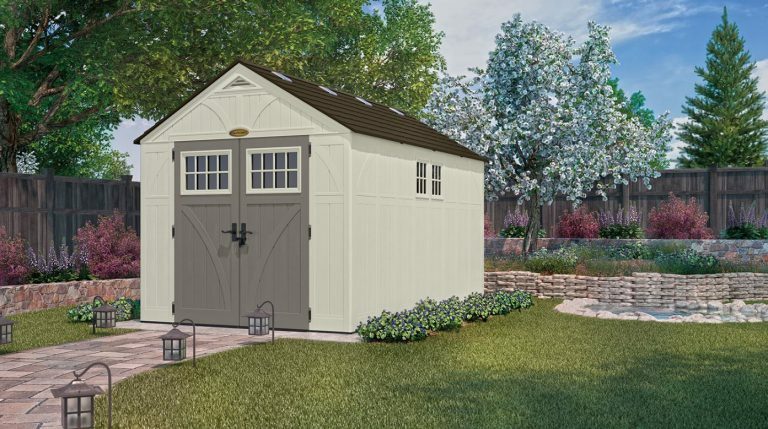 All sheds include a resin-made built-in floor that’s strengthened for storing heavy items. Suncast recommend building the shed on either a concrete base or wood base. It’s essential that all plastic sheds are built on a solid level base. 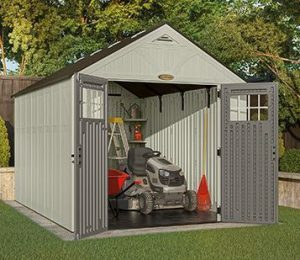 A solid level base provides integrity for the shed’s overall construction and usage, making every part line up correctly during assembly resulting in stability for a long lasting shed. The floor will serve as a heavy duty floor if the base is solid and level. This is imperative. A concrete base is a great option, just make sure it’s level and use expansion bolts to secure the shed down into the concrete shed base. The floor has indentations, pointing out where to anchor the shed. A wood base seems to be a more popular alternative as it’s easier to assemble. Raised slightly above ground level on compacted crushed gravel ensures the shed is not subject to flooding. 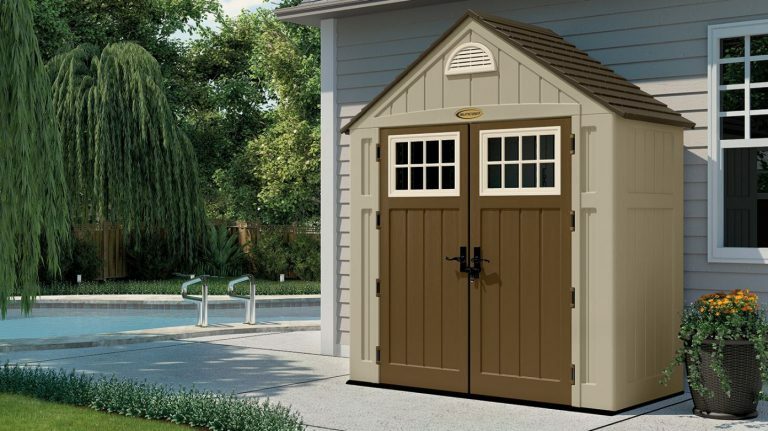 Suncast recommend fitting plywood to the wood foundation to serve as the shed base and anchor the shed floor with wood screws down into the shed base for protection against windy weather. Make sure the plywood is thick enough to support the weight of the shed plus the weight of storage it will store. Many opt for decking as their shed base (although Suncast recommend plywood) and drill a few holes under where the shed will sit to allow water drainage under the shed. It’s common to use wide washers with the screws when anchoring the shed floor down into the base to increase stability. These sheds require two people to construct. Suncast have designed an easy bolt technology to make installation simple and quick. A screwdriver, adjustable wrench and a rubber mallet are the minimal tools required to construct. Assembly can take anywhere from 3 hours to a day, depends how big a shed you are building. Top tip: Get all parts out and organised before assembly as the build will go a lot smoother. Don’t build on a windy day, choose a calm day as the panels can be a nightmare to align and hold in wind. Like all plastic sheds they start off quite flimsy but once the roof is attached to the walls the final result is a strong and sturdy shed. Suncast make it very clear not to over-tighten the screws, they only need to be snuggled down, over-tightening can ruin the thread, therefore a manual or ratchet screwdriver is key here rather than a drill-driver. There are a lot of screws, don’t get overwhelmed, take your time, one person holding and aligning whilst the other person inserts the screws – you’ll get there in the end. Be very careful when using a rubber mallet to align the walls to prevent denting them. You will need clearance all the way round the shed to install the roof panels. 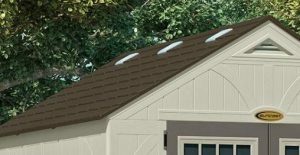 Suncast roofs have an excellent peak leading up to the top of the apex allowing for excellent rain-water and snow drainage. The roof is made from durable resin, molded to give a stylish tiled appearance. Skylights are built-in to the roof on some models to allow for more daylight into the shed. The roof is well designed, extending beyond the shed walls to prevent water build up and leakages at the top of the walls, resulting in a well sealed unit. Keep in mind not to over-tighten the screws in the ceiling panels, to prevent ruining the thread – a snug tighten is all that’s required. The roofs structure is secured together with metal trusses and a ridge beam to provide added strength. 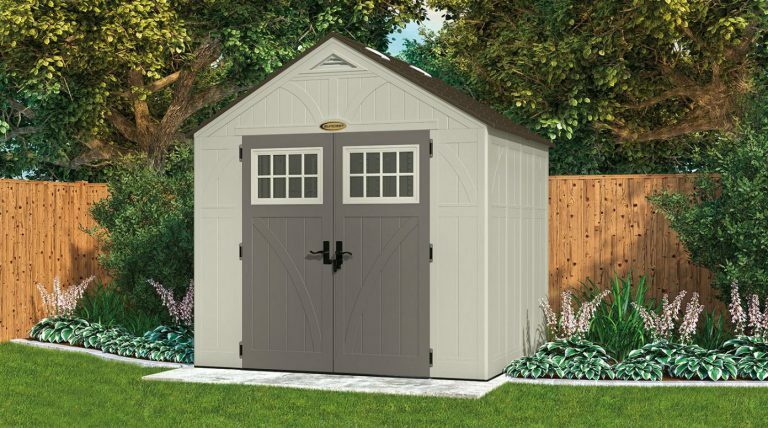 Overall, the classic design of their sheds along with the shingle style roof panels and architectural details give a truly sublime look that blends in to any landscape – a great addition to any garden, serving such a useful purpose. All Suncast sheds have windows in the doors, it’s what give Suncast their distinctive look. Models vary whether they have windows in the walls or skylights in the roof but they do serve as an important safety feature for vision inside the sheds. The fiddly part of building these sheds is inserting the windows. They have a rubber seal that has to be fit with the window, this is very difficult to keep in place whilst screwing into position. Masking tape or a small drop of super glue has helped many install the seal with the window and screwing the opposite corners has helped align them correctly – this does cause a bit of frustration. Ventilation is another important feature that all plastic sheds should have built-in to provide air circulation. A plastic shed without ventilation would be subject to sweating and these work wonders. All Suncast sheds have ventilation built-in above the doors at the top of the apex to provide a safe environment. The widows in the door add good light as do the windows in the walls and skylight, check whether the model you’re interested in has windows in the walls and skylights as the models do vary. Ventilation is key too as it provides a safe environment and prevents inside the plastic shed from sweating. 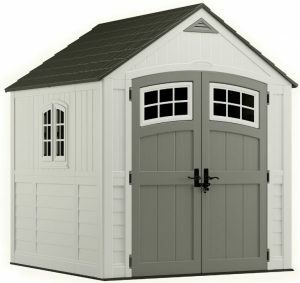 The sheds have good height without the feeling of being hemmed in and bent over, a nice airy feel to these sturdy sheds. The floors are strengthened to allow the storage of weighty items. The larger the shed the more the floor is reinforced to allow the storage and support of a tractor or sit-on mower, another reason it is absolutely essential the shed floor is laid on a solid level base, the floor will then serve you as a heavy duty floor capable of coping with the stresses of demanding use. Shelves are included on many models, check the model you are interested in. Additional shelving, loft kits, baskets, hooks and other accessories are available to purchase separately. Another option is to go for stand-alone shelving, a popular option with plastic sheds as you cannot screw into the walls to hold shelves for storing heavy items. Wide, robust double doors open into all Suncast sheds providing great access to all storage. Windows are built into all the doors allowing natural light to flood in. Door handles vary from traditional to more modern dependant on the shed model but the doors overall have the unique and distinct look of Suncast. The doors are fitted with metal hinges to provide a sturdy feel and a smooth operation. 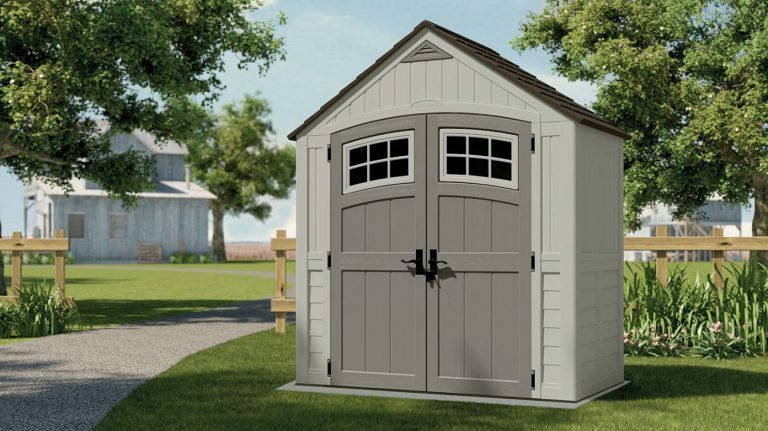 Metal handles open and shut the shed, the doors can be locked with a padlock for security. Padlock is not included. Both doors can open or one door can remain closed whilst using the other door. The closed door contains built-in metal latches/locks, one for the top of the door, the other locks into the ground. Once the other door is shut a padlock is required to lock both doors together. Although quite rare, it has been mentioned that if the shed doors are going to be subject to blazing hot sun they can warp over time. It maybe an idea to point the shed doors away from direct sun or position the shed in the shade – just a thought! 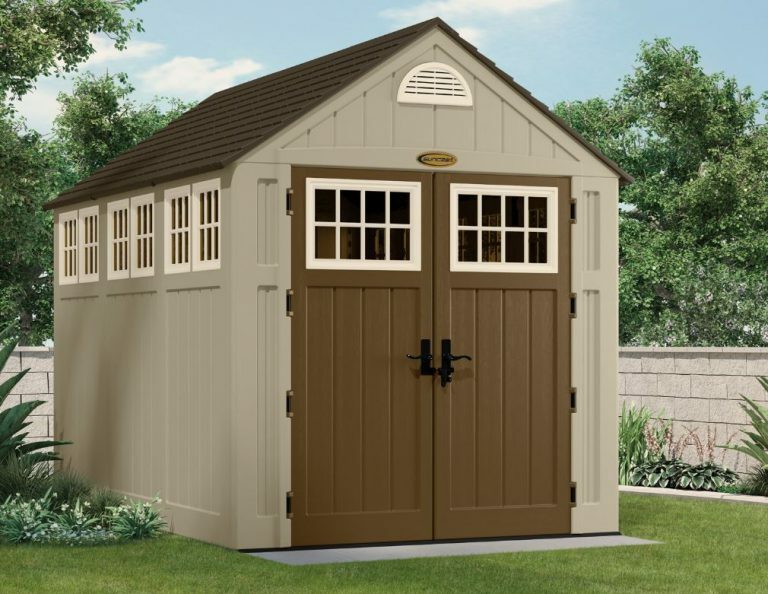 Unlike a wooden shed Suncast sheds will not rot and decay, will never require re-staining, re-painting or re-roofing like a wooden shed does. 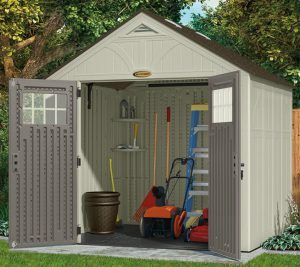 A Suncast shed will not rust and require re-painting like many metal sheds either. The maintenance duties are a wash down when dirty, which is common to do with a hose or pressure washer (not on a high pressured setting). Be careful around the vents when hosing as this may let water in. 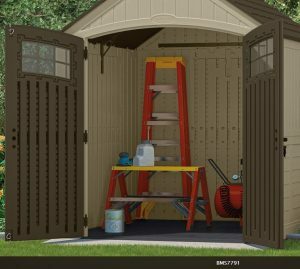 If the shed becomes ingrained in grime or mildew it may require wiping down with cleaning solution mixed in with warm water, this usually does the trick. Never use abrasive pads like wire wool or scrub-buds as they may mark the resin surface, a soft bristle brush is ideal. If cleaning solution still doesn’t work try: two cups of white vinegar and two tablespoons of washing-up liquid into a bucket of warm water and wipe the stains off with that. 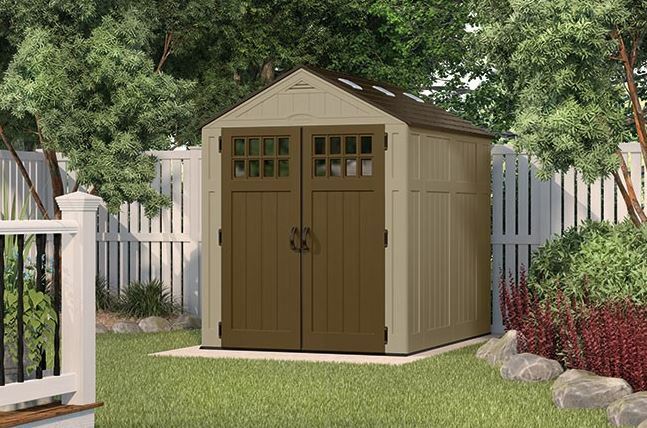 If your shed is subject to staining with sap from trees , wash regularly or as soon as you notice it, as over time this becomes more difficult to remove as sap chemically bonds to the surface of resin. This produces amazing results and receives outstanding customer reviews and feedback. 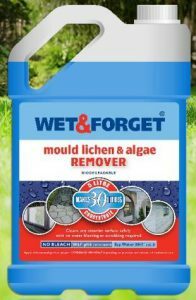 ‘Wet & Forget’ is a moss, mould, lichen and algae remover. Simply put 1 part ‘Wet & Forget’ to 5 parts water into a garden sprayer and spray your shed, then leave it. It usually takes up to a week for the weather and ‘Wet & Forget’ to remove the mildew, mould and algae. It’s really as simple as wet it and leave it. Wet & Forget contains no bleach, it’s non-acidic, non-caustic. It’s biodegradable PH8 (water PH7), there’s no rinsing, waterblasting or scrubbing required. Just wet it & forget it. 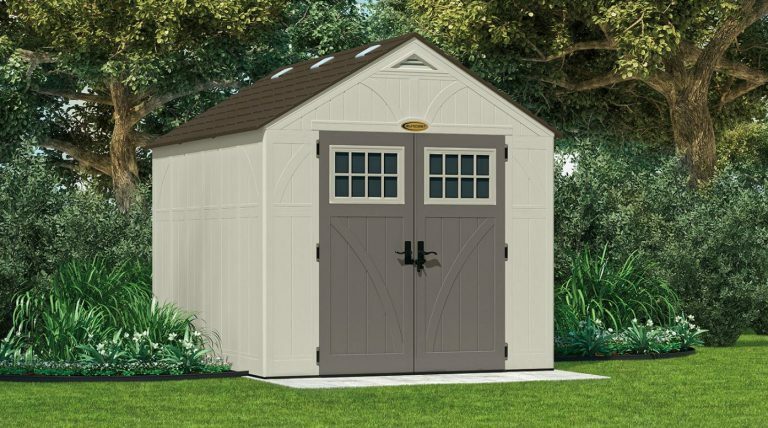 How much do these Suncast sheds cost? If you have any questions, I’m always happy to help. Drop them in the comment section below. 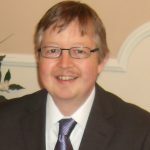 Hi David, thanks for dropping by to read about Suncast’s range of walk-in storage sheds. 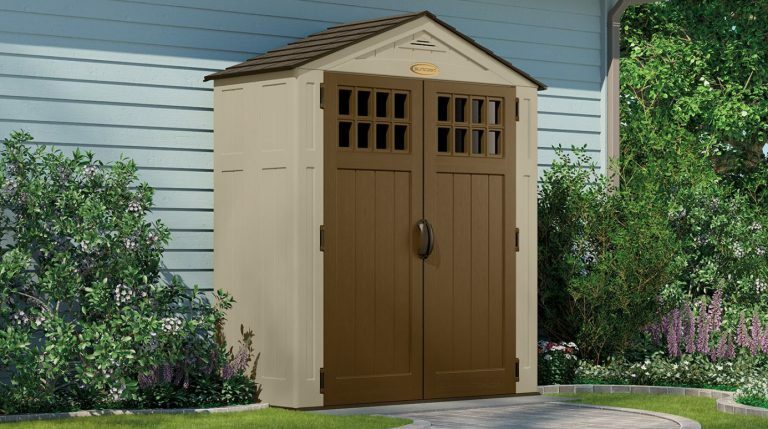 I only write articles reviewing the various styles and types of weather-resistant sheds, we don’t supply any. Writing this website is simply a passion whereby visitors get an unbiased view to what the market is presently offering with regards to decay-resistant sheds, whether they’re resin or weatherproof steel. Shed Sizes is a page that steps out sheds in order of their size to which I have so far reviewed. here. I just stumbled upon your website browsing the internet, but will book mark your site for when I’m ready to invest in something like this. 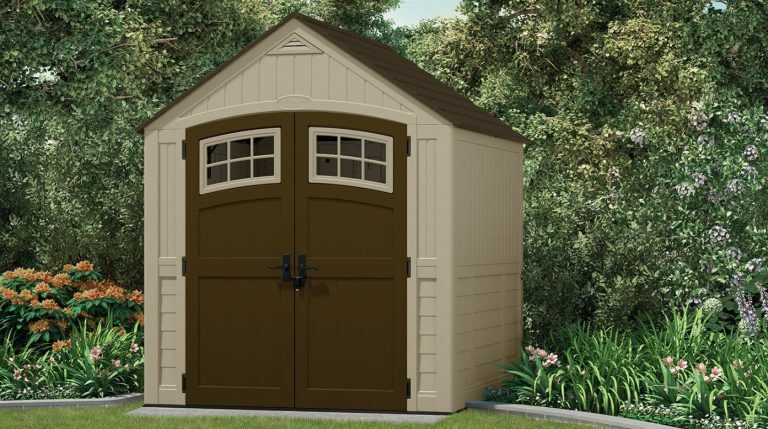 Yeah, these Suncast sheds come in a variety of different sizes, all with a distinct look of Suncast. It’s just a case of choosing the style you like the look of and space you can accommodate. 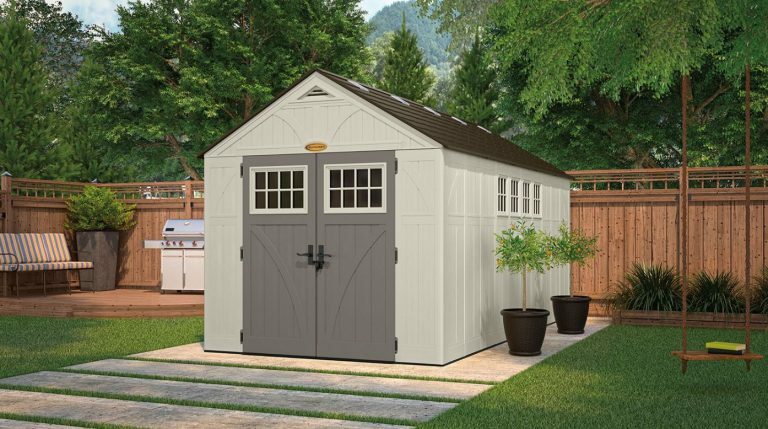 These sheds will enable you to make more room indoors by moving your outdoor gear out of the home.